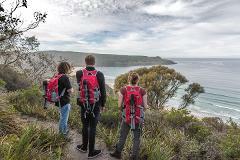 Nature walk on the Cape Queen track to Mars Bluff – Lagoons, secluded beaches, dunes, ocean waves, cliffs, plants & birdlife. Includes packed lunch & morning tea, Neck Wildlife Zone visit, Get Shucked Oysters, Cider & Bruny Island Honey. A personally guided small group tour with our expert island tour guide’s over 2 days. 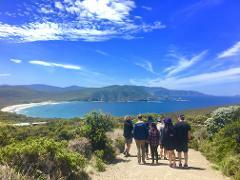 Embracing nature, wilderness, White Wallaby in the wild, dramatic sea cliff coastlines, sweeping beaches and convict heritage on the Bruny Island. 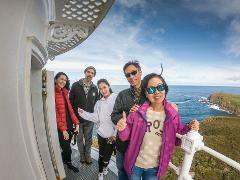 Iconic Cape Bruny Lighthouse Tour within the South Bruny National Park. A heritage listed lighthouse first commissioned in 1836 and all the original working mechanisms remain today. Photo opportunities at every point of the compass. Join our very special Sunset Lighthouse Tour for small groups only on Friday and Saturday evenings or other nights on request. 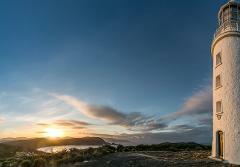 “Self-drive” into the South Bruny National Park and arrive at the Cape Bruny Light Station - well before sunset. Bruny Island Foods, Sightseeing & Lighthouse Tour. Meet the islands finest food producers, see the amazing coastlines and National Park. 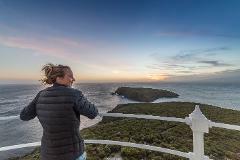 Includes lunch, all food tastings, white wallaby in the wild, park entry & CAPE BRUNY LIGHTHOUSE TOUR. Bruny Island Foods, Sightseeing & Lighthouse Tour. Meet the islands finest food producers, see the amazing coastlines and National Park. 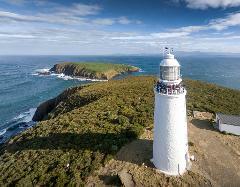 Includes lunch, all food tastings, white wallaby in the wild and exclusive CAPE BRUNY LIGHTHOUSE TOUR.